Its been years since I was serious about blogging. I have been doing Project Management for a long time, but never got around to getting certified. In my previous role as a Product Development Manager for example, I sccessfuly managed multiple projects concurrently (as many as 7 at a time) some with short scope, while others were multi team member projects spanning multiple years. That experience gave me alll the work experience that the PMI requires, and I already have completed all the educational PDU requirements, from training I have attended plus courses in Management that I completed as part of my Master’s Degree in Public Administration. I have now gotten motivated to get Certified. I hae re-joined the PMI (Project Management Institute), and am in the process of preparing to take the official exam to be certified as a PMP (Project Management Professional). Wish me luck, as the 4 hour sit down exam will be rough (and lots of people fail it), but I am well on my way to completing it. I have been focusing a lot on Social Media interaction recently instead of writing blog articles. Why don’t you take a moment and follow me, or take a look at my recent posts? I am interested in hearing your thoughts. 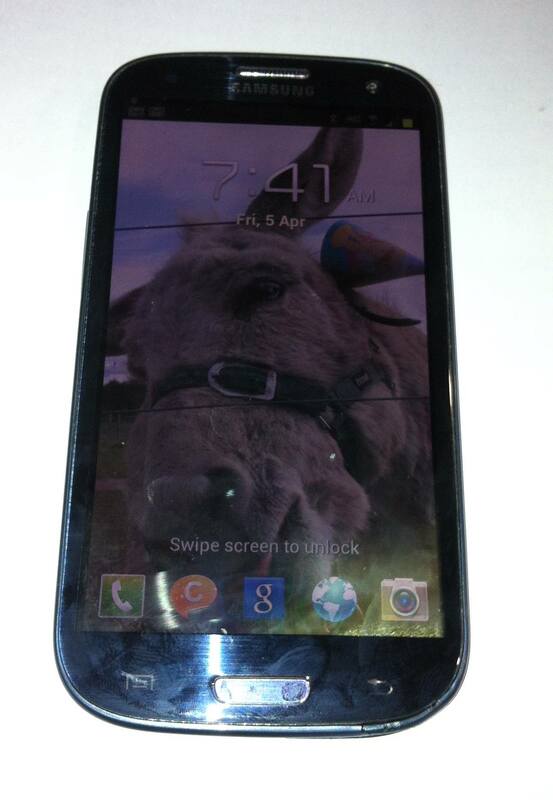 Posted in auction	| Comments Off on wheedle is back – trademe’s competition? 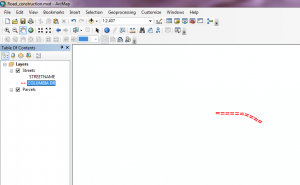 In this third article about using ArcMaps for analysing property locations, we will continue the search demonstration that we started in the previous GIS article. 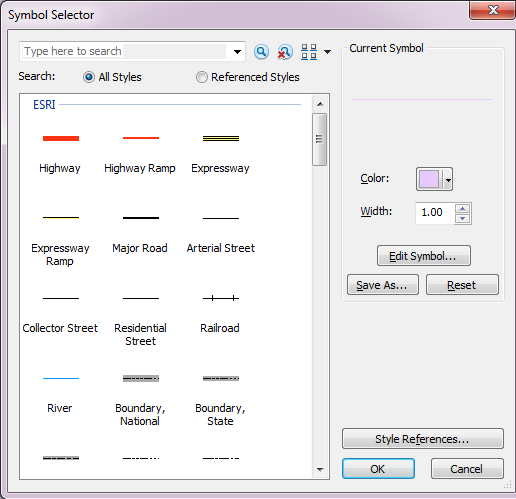 The next step is to select the road segment that will be built. 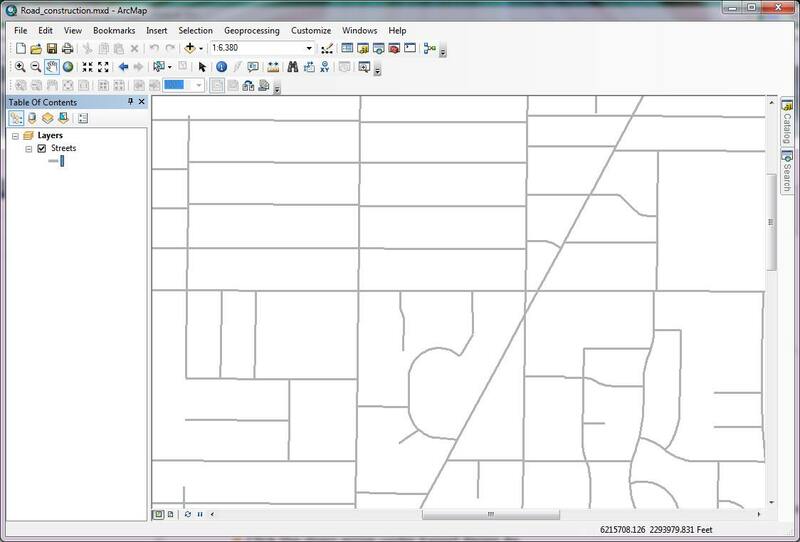 and then use ArcMap search functionality to locate and run a geoprocessing tool to determine the parcels whose businesses and residents will need to be notified about the construction project. 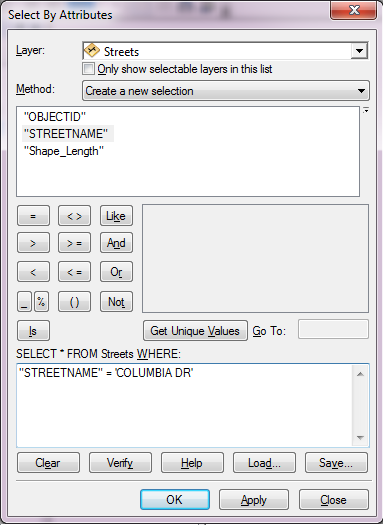 From the Selection menu, choose Select By Attributes. 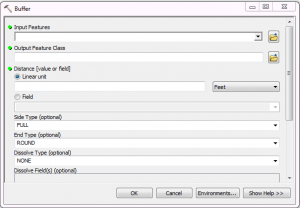 For Method, choose Create a new selection. 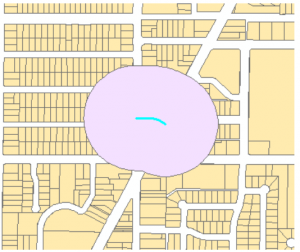 Now click OK and you will see the selected street segment highlighted in blue near the center of your map. 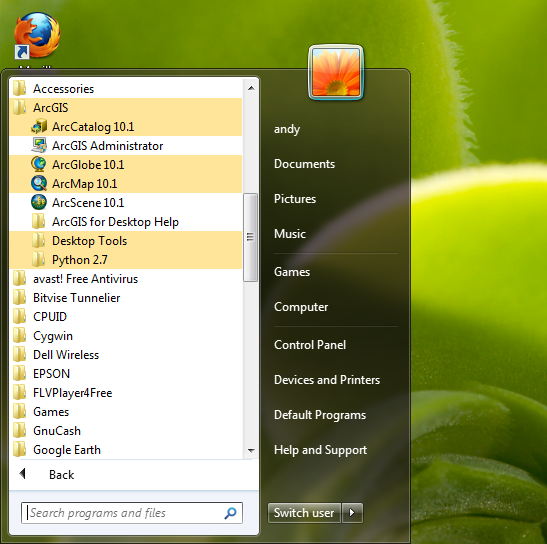 Open the Search window, and at the top of the window, click Tools. In the Search field, type Buffer and click the Search button. 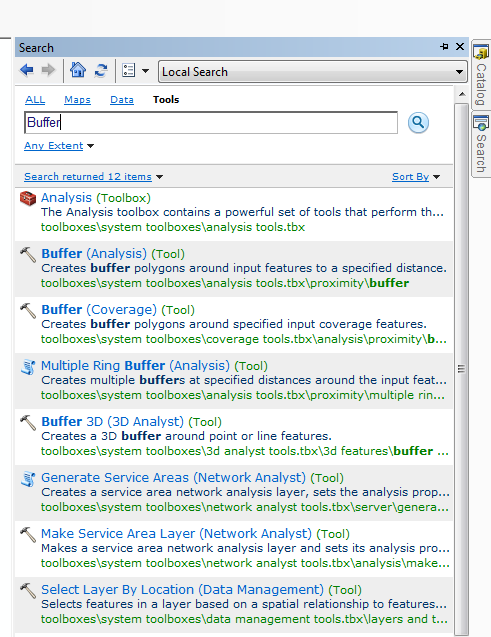 In the list of search results, click the Buffer (Analysis) tool. Clicking the tool name in the search results opens the tool, just as if you had opened the tool from ArcToolbox. for Output Feature Class, browse to your City geodatabase and name the output Buffer500. 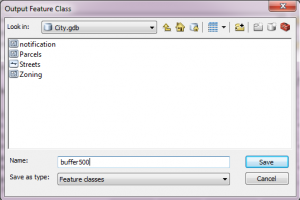 Click OK to run the Buffer tool. 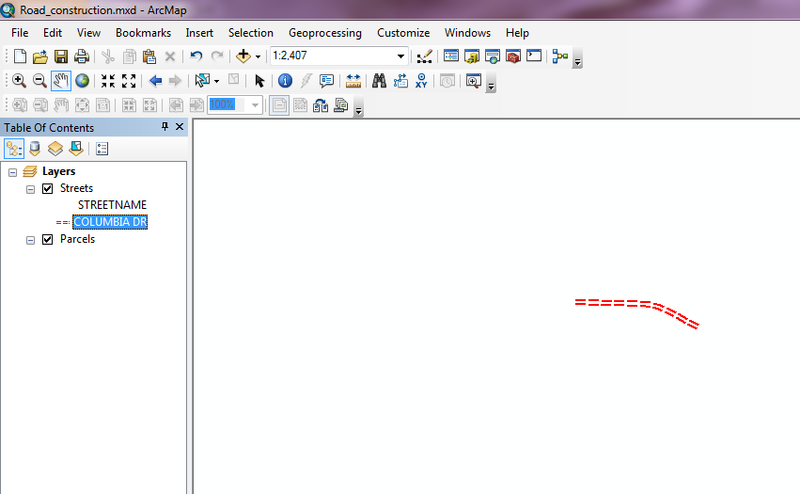 While the tool is running, notice the name of the tool scrolling at the bottom of your ArcMap window. 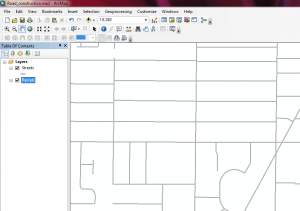 The Buffer tool allows you to be more productive by letting you continue to work in ArcMap while geoprocessing tools are running in the background. 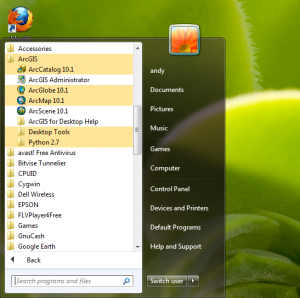 When the tool is finished, a message displays in the lower-right corner of your computer screen. 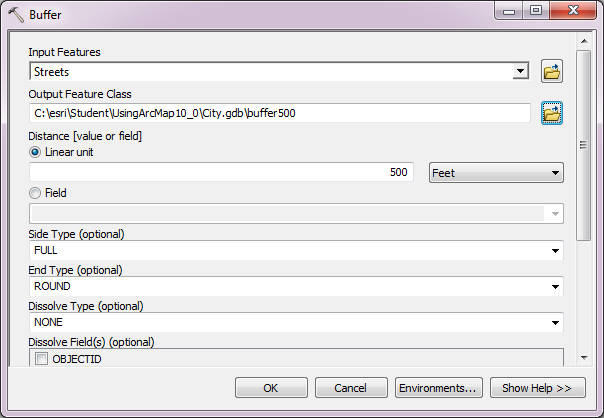 The Buffer500 feature class is added to your map as a new layer. 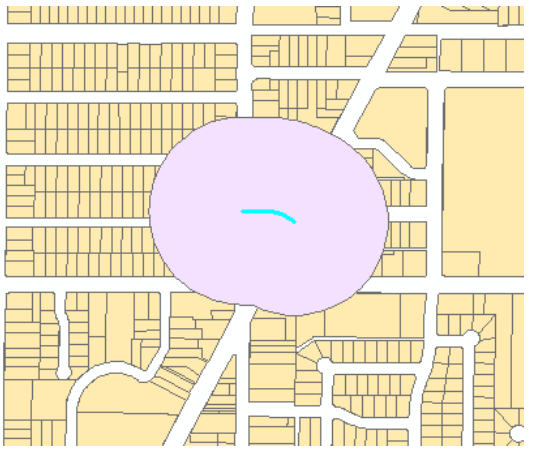 This shows the region within 500 ft of the road under construction. Now, we need to select the parcels that intersect the buffers, so that we can send the owners of these parcels a notification letter and maps showing the construction area. From the Selection menu, choose Select By Location. 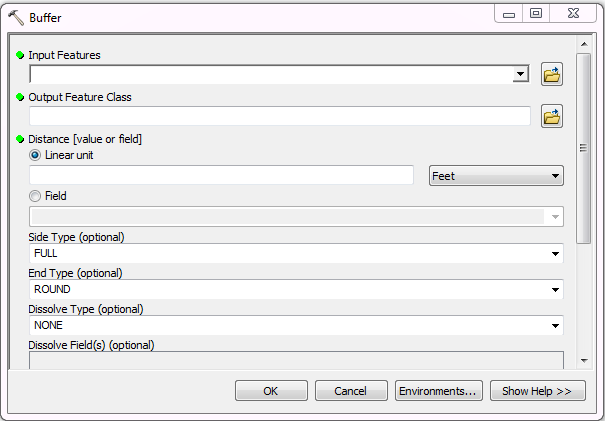 For Selection method, confirm that select features from is selected, and for Target layer(s), choose Parcels. 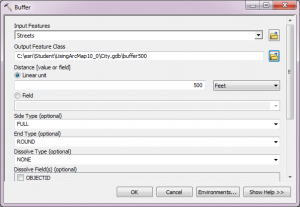 For Source layer, choose Buffer500, and for Spatial selection method, confirm that Target layer(s) features intersect the Source layer feature is selected. Finally, click OK to execute the spatial selection. At the top of the table of contents, click the List By Selection button. 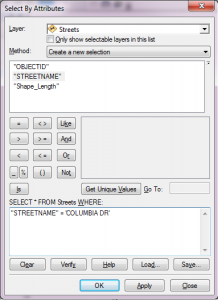 Your table of contents should look like the following example for the Parcels and Streets layers. We now know the parcels selected that intersect the construction zone buffer, and can generate maps and letter for the affected owners. In the final article we will show this functionality. Did a bit of hardware repair this week. Also, to make things more interesting, I took apart a laptop to fix a broken fan. Talk about a mess, I had to remove 37,000 screws, and remove multiple panels connected by 97 ribbon cables. They don’t make them like they used to. Not my favorite activity. 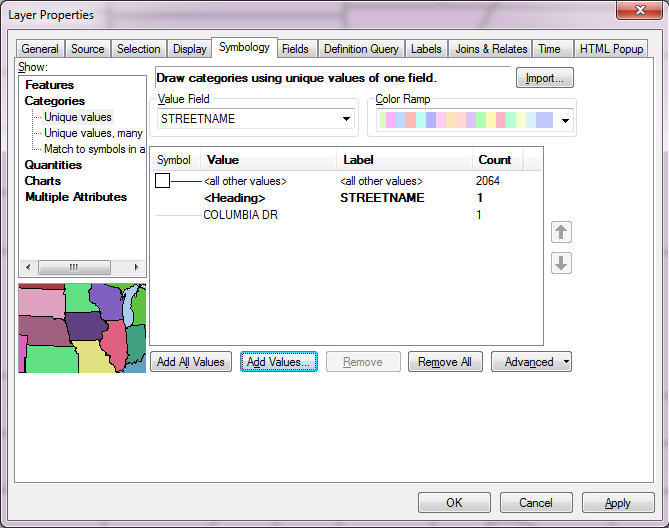 In this example, I will use the sample data provided by the ESRI tutorials, which are available online after registering a Global ESRI account. I highly recommend going through their tutorials, as they are a great resource. 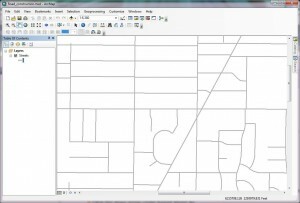 First start up ArcMaps, as described in my previous post. 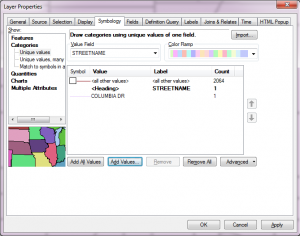 Once open ArcMaps, you will see an opening screen that ask for the data source. 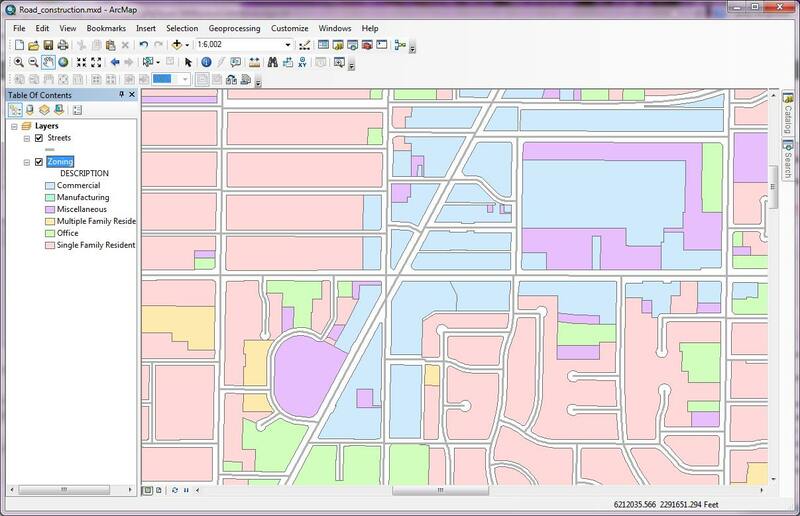 On this screen, we want to create a map, using the City.gbd geodatabase as our data source. Instead of using a blank map, we want to click Existing Maps, and Browse for more. 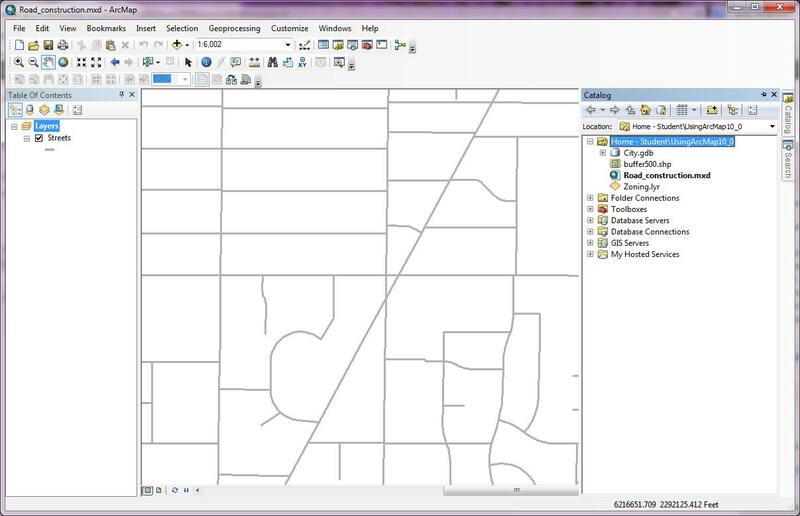 Then Navigate to your example install location, (C:\Student\UsingArcMap10_0 folder), and click Road_construction.mxd, and finally click Open. 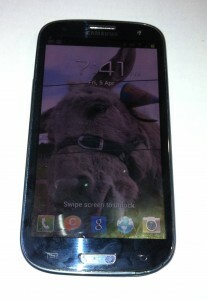 The area on the left of the screen is known as the table of contents. 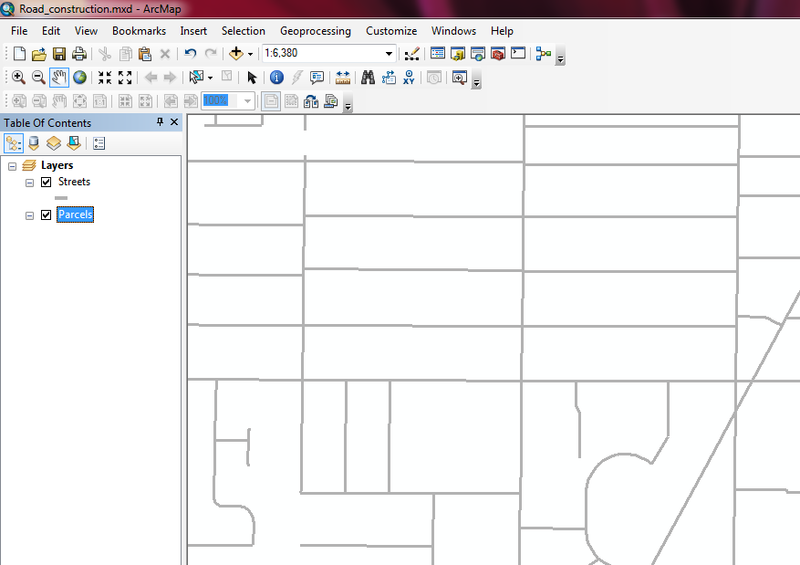 It currently shows one layer, which is “streets”. Notice the checkbox, which you can tick (or untick) to hide or show the street layer. Now, from the Bookmarks menu, choose “Construction Zone”. This will centre your street layer in the area we are using in this example. 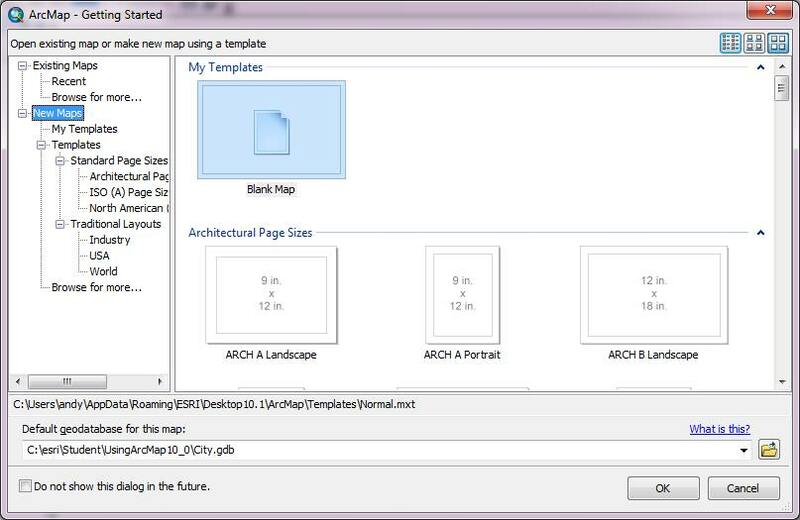 Now, click the Catalog tab on the right side of the ArcMap display, to display available catalogs. We are going to drag the once of these onto our map to add additional information. Again notice that you can turn this layer on or off (hide it) in the table of contents. In the next blog article, I will go through searching for data, where we will add property information to the map, and determine which properties are close to a specific area of concern (in this case a bit of road construction). 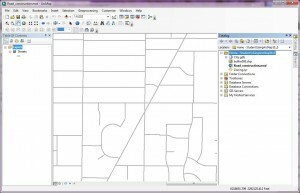 Following up on my last post about GIS (http://computingasyoulikeit.com/getting-started-with-gis/) I am writing today about installing and launching one of the most widely used GIS tools available today. but ESRI can do just about everything, if you have the $ to pay for it. A few open source products exist if you need one, including: Quantum GIS and OSGeo.org and penn state has some links as well. 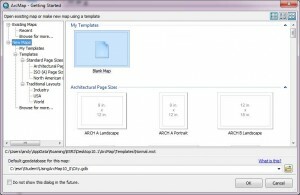 If you want to try ArcGIS, go to their download link for ArcGIS Desktop this link will let you download a 60 day trial of the latest software (a single user version). 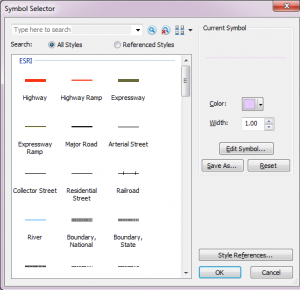 The first thing you will need to do is create a Esri Global Account. This registration is free, and gives you access to their download area. 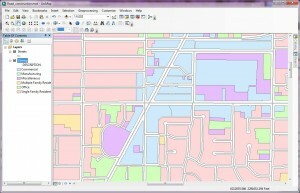 When I downloaded it (ArcGIS for Desktop, version 10.1) the size was just under 1 GB. Note: Requires Microsoft .Net Framework 3.5 SP1. I installed under windows 7. I wrote an article over a year ago about how to get twitter followers, and thought it would be a good idea to provide an update. You do NOT have to pay for twitter followers. I have close to 5000 and have never paid a cent. Yes it is a bit slower, but doing it over time will get you better followers, who are more likely to stick with you, assuming you provide decent, relevant content. Create a twitter account if you have not already done so. Look at interesting twitter accounts, in a topic you will be tweeting about, where you would like followers, and find someone with lots of followers. Thousands would be great. Skip any followers that have a blue check next to their name, unless you really love following their tweets, as they are “confirmed” followers and are not likely to follow you back. Also, try and skip the ones with < 5 tweets, or who have not tweeted in a long time, they are not active and are unlikely to follow you. Open up their list of followers, and add a LOT of them. Note: Don’t add a thousand in the first day or twitter may ban your acccount. Do it over a few days. If you hit a limit and twitter won’t let you add more followers, it is because you do not have enough followers. For example, you cannot add more than 2000 followers unless you have at least 1500 following you. Right now, at close to 5000, I can still only follow about 500 more than are following me. Wait several days, and see how many follow you. It won’t be thousands. While you are waiting, follow anyone who is following you. This is important because if you don’t, they may stop following you. Once you are logged in, click the link to see “who is not following me back”. Un-follow all those people. Go back to number 3 and repeat. After a few times, your numbers will start growing faster, and people will add you even if you don’t add them first. When adding users, the best kind are the ones who follow thousands of users, especially those who follow more people than are following them – those people are more likely to follow you. As I am getting more followers, I have started deleting the ones that have never tweeted, and I always delete all the ones that are linked to naughty URLs or post absolute rubbish. I don’t want to help them advertise for adult services. I have deleted a number of questionable followers, so I would have a lot more followers if I had blindly accesped all of them. Now, go and follow me, and I will follow you back.